I had meant to write this review, what seems like, a year ago, but then life got in the way and my blog has mostly gone unloved. But, now it is heading in to the warmer seasons again, I’m reminded almost daily that I need to write this up! Greenfoot Mama is based in the Northern Rivers, on the coast. She makes a line of organic products and is passionate about decreasing carbon footprints, living holistically and helping nature while becoming more attuned to nature and living ” naturally”. ‘The key focus was to create an indulgent choice of organic products that protect and nurture, whilst providing an array of holistic qualities without damaging our bodies or our natural environment. 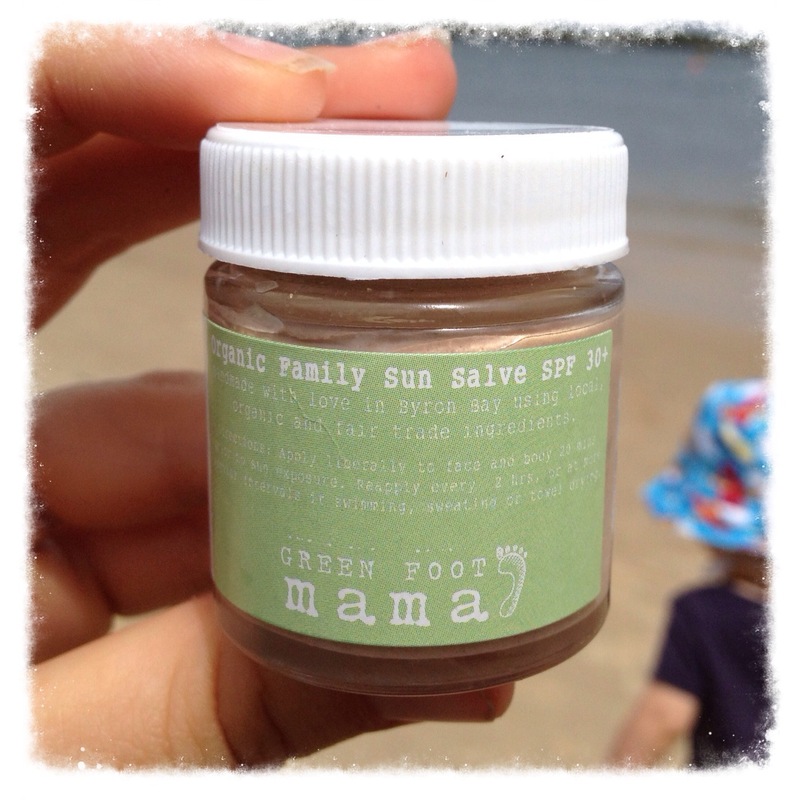 Respecting and preserving our precious oceans whilst honouring our bodies with safer products is where Green Foot Mama is at. Now, BallinaGirl has some weird genetic throwback that has given her a lovely light olive complexion. But, BallinaBoy on the other hand, is the definition of pale. I have used this product on both of them, and myself and the first thing I have to say is I love the smell!! I actually had one of her first tubs that didn’t have her new labelling on it before this new batch, and loved it too, but I find this one to be even better. The main reason I love this (other than the smell) is that I can pronounce the ingredients (well, the unscientific names for them anyway) and actually know what they are, and while it isn’t ideal, I don’t have to be scared of the kids eating it (which has happened with other creams!). I have used it at all different times of the day, and have found that it works best when applied 10-20mins before you get to the beach, particularly for outings during the ‘UV danger zone’. Nothing scientific behind this reasoning, I have just found this works better for BallinaBoy. Also, reapplying a lot more often than those “4 hour waterproof” sunscreens you get in stores (we also make sure he has other sun protection on too, as this sunscreen alone does not stop the burn on him during the peak UV times). I’ve been caught out a few times, getting home from the beach with BallinaBoy looking a bit like a tomato. 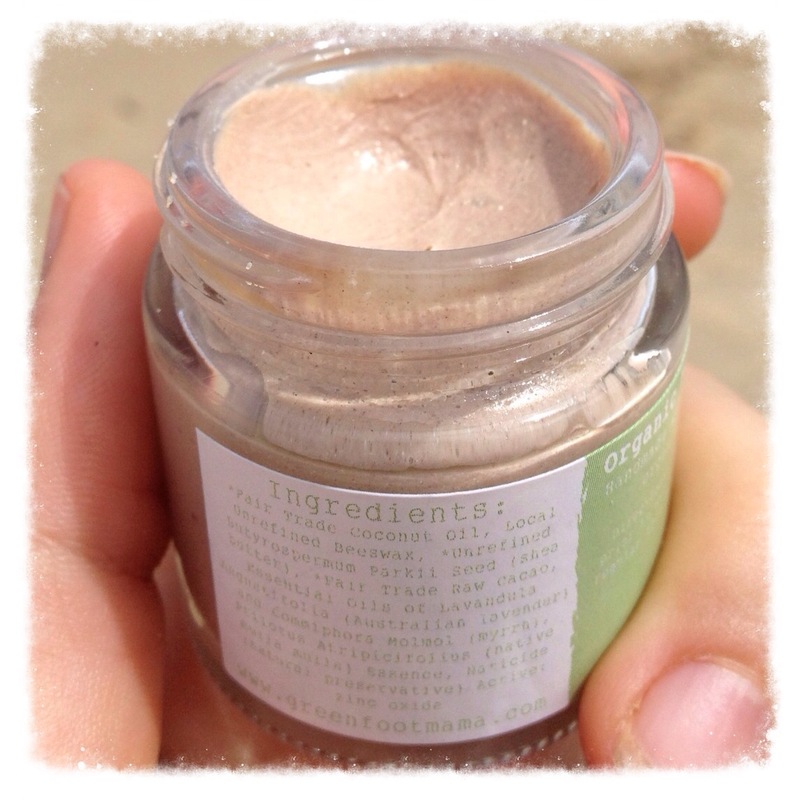 But, luckily you can also use the cream as an after sun balm, and it still smells good then too. It can feel a bit oily when first applied, but still feels a lot better than normal store bought sunscreen. It feels lighter, like your skin can still breath. It feels good for your skin, like it is moisturising it at the same time. It doesn’t have that thick sticky feel when you are trying to apply it either. It seems to work great for BallinaGirl, and have often considered giving the preschool the tub for her to use there, but I think I’ll have to get a new tub for us before I can do that. If you want to get your hands on some, you can purchase some from her website (which seems to be currently undergoing some renos), through her facebook page, or you can email Olivia.. Or if you’re local to Lennox Heads, I believe a few stores stock it too!